If you have a lot you’re juggling right now, it’s easy to feel like you don’t have time to eat nutritiously in the morning. But, as I’ve written about recently, you can’t expect your body to run efficiently and productively if you’re not fueling it well. If you don’t have a plan for what you’re going to eat for breakfast, it’s much easier to just grab a pop-tart or something else that isn’t too nutritious. Take 15 minutes on the weekends to plan out your breakfasts, lunches, snacks, and dinners for the following week, and it will help your mornings run much more smoothly, not to mention saving you unnecessary trips for takeout! It’s better to eat the same nutritious breakfast every morning, than to eat junk or nothing at all. There’s nothing wrong with keeping things simple! Find something — or a few things — that work for you to pull off for a quick breakfast and then stick with them. When breakfast is already prepped in the morning, not only does it help you to wake up and feel like you’re already ahead, but it also will help guarantee that you eat something healthful before jumping into your day. A few make-ahead breakfast ideas: Fruit Salad (or chopped up fruit), Hard-Boiled Eggs, Baked Oatmeal, or Overnight Cinnamon Apple Oatmeal in the crockpot. If your weekdays and nights are packed, you might not have time to prep much food, but see if you can carve out an hour or two on the evenings to make some food for your freezer. As I’ve said often here, freezer cooking can make your life so much easier — and save your sanity, too! If you don’t have time to prep food ahead of time and your freezer is bare, find a few breakfast ideas you can fall back on that are nutritious and can be made in a short amount of time. A few quick-fix breakfast ideas: Peanut butter on Whole-Wheat Toast, Pick-Me-Up Smoothies, or Scrambled Eggs. What are your favorite quick and easy go-to breakfast recipes? Bedtime: Made it to bed at 10 p.m. last night. I won’t give you my laundry list of reasons why I stayed up 30 minutes past my bedtime, but I will say that I’m going to make a point to be in bed before 9:30 p.m. tonight. I’ll let you know how it goes tomorrow! 3. Did you get in some exercise yesterday? If not, make a commitment today to a specific way you’re going to incorporate exercise into your week on a regular basis. 4. What’s your plan for making sure you’re eating a nutritious breakfast every morning? Leave a comment and tell us about what’s working for you or what you’re going to experiment with. Wake-up – I dragged a little this morning but was up by 6:20. I’ve been surprised to find that I did better last week when my husband was gone. It’s easier to stay in bed when he’s the one hitting the snooze button. Exercise – I pulled on my running clothes and ran a mile this morning after 6 months off due to injury. It was good to get out there, but I was a little rushed afterwards. I guess I need that extra 20 minutes in the morning. Tomorrow, I will aim for 6:00. Breakfast – I was just thinking last night at bedtime that I need to stock our house better for breakfast. I love scrambled eggs, turkey bacon and toast for breakfast. So, I need to make sure we always have that on hand. My son would like it too. Thanks for the encouragement. I am really looking forward to these posts each day! So encouraged by this series. I have been getting up at 5 or 5:30 every morning to do some of my freelance work. I am amazed how much I get done and in less time. That’s what I would think too, but I also go to bed WAY earlier when it is cold and dark. So I have no problem getting up at the same time, if not earlier. I eat old-fashioned rolled oats oatmeal with a little sugar, milk, and peanut butter pretty much every morning. I absolutely enjoy it and look forward to it. Protein is a must for every meal, since your body doesn’t store it. When I eat pure junk for breakfast, I crave junk the rest of the day. A good breakfast really does make a difference. Can you tell me how exactly you make tht? Sounds good! For my family of 4 (two adults, two young children), I put ~2 1/2 c. water and 1 c. oats. Bring to a boil and serve. That ratio of water/oats makes a medium consistency. Then, just add sugar/cinnamon/peanut butter to taste. Yea this is a habit I have already incorporated into my day! Night before routine: Did really well because this really helps me! The to-do list in particular is useful. Bedtime: Got in bed at 9:00 and asleep by 9:30. Did not sleep well because my back hurt :(. Wake up time: 5:45 am and got up right away. Exercise: Stretched 20 minutes and walked 4 miles. Also did 1 hour of PT. Breakfast: I make breakfast food on my freezer cooking day. I made muffins last week and breakfast burritos. I make myself bran muffins and eat yogurt and fruit as well. Life is settling in but I will miss this challenge when it is completed :(. Must Do’s: I wasn’t feeling well last night so I only did 4/5 of my list. Unfornetly the one thing I didn’t do was get my husbands lunch ready…so we were both in a bit of a rush this morning. Wake up time: 5:30 actually slept in until this time!! I was so happy! Breakfast: So funny that this post is today…this morning as I was sitting at the table eating chocolate pudding for breakfast (in my defense: pregnancy craving) and my husband was rushing out the door with out eating breakfast (again) I was thinking we both really need to start eating better breakfasts…I think at night when I am getting hubbys lunch ready I’ll make something for breakfast too, since I’m already in the kitchen! I made it to bed just shortly after my 11:00 p.m. time last night and took care of all 5 of my to-do’s. I’m still shooting for 7:00 as my get-out-of-bed time, but today I actually got out of bed around 7:15 this morning. I did my full 20 min workout in this morning, and it felt great to be able to do the whole thing without having to shorten the time! I menu plan each week, I like to keep breakfast nutritious and simple for my husband and I. We usually rotate between oatmeal, cereal, or breakfast burritos from the freezer with some sort of fruit. It works well for us, although, I’d like to get away from cereal as much as possible-so expensive! I try not to pay more than $1-2/box for Kashi. Instead of sleeping in like I have been, I woke up two hours before my planned wake up time with my husband. Not gonna lie, I’m tired, but I admittedly do feel more accomplished with the more time in my day. As for breakfast, I try having a bowl of cereal with a banana, a toaster strudel or pop tart witb a glass of milk. I like keeping breakfast as low key with as little effort as possible while I concentrate my efforts on other areas of my life. Once things settle down, setting aside a little time to make breakfast will come. Working out didn’t happen yesterday, but it absolutely will today! I’ve been going to bed before 10 each night…. I’m in there between 9:30-945 ish and read for a bit…. Sometimes I get so comfy and relaxed reading, I begin to nod off. I have been getting up around 6:45 am. My go-to healthy breakfast is either oatmeal or cream of wheat and turkey bacon. My kids like this too… They also like a little fruit, esp my daughter…like cantaloupe or honeydew chunks. I also love kashi blueberry waffles for something quick and easy! I made crystals breakfast burritos and we love them…. My hubby takes one with him to eat in the car on the way to work. I can’t believe you got up at 4:35! That’s amazing! I expect you’ll get to bed by 9:30 tonight after that early rising. I didn’t get up until 6:30, but it was still a very good morning. I exercised and made a good breakfast (eggs). Last night was a late night out at a ladies devotional. I decided to leave my kitchen half way done in order to get to bed earlier. I made it there by 10:30. It wasn’t pleasant coming out to a messy kitchen, but at least I wasn’t exhausted this morning. I’m learning that a lot of my evening must dos need to be completed quite early if I want to get to bed on time without feeling rushed. I went to bed early! I did not hit the snooze button but I lounged in bed for a while afterward anyway. This breakfast post is for me since there are multiple mornings when I get to 9 or 10 am and still haven’t eaten anything. I hard-boiled eggs after reading your post. Thanks! I did some freezer cooking last night. I also packed up a few boxes for my big move to Chicago next week! I was able to pack, cook, clean, organize and pay a few bills. Now that I have five tasks I don’t feel so stressed about this move to a new city and a new school! Four hours away is a big jump! I usually grab a very unhealthy toaster pastry or snack bar on the way out the door. Mornings I’m at home its cereal. I am looking forward to trying some of your freezer breakfast ideas to help start the day better foodwise. We eat cereal a lot at our house, but we do homemade things two or three times a week. I plan one brunch item each weekend, like pancakes and make extra for the freezer. Thanks for taking the time to post your wonderful ideas! Are you no longer following a gluten-free menu plan? Breakfast is the hardest gluten-free meal for me to plan — no regular toast, pancakes, oatmeal, muffins, waffles! P.S. — The gluten-free waffle link takes me to a whole-wheat chocolate waffle recipe! I’m with you, Nikki. It’s hard to get a reasonably priced and quick gluten free breakfast on. I would love to hear what others do. Here is what I am doing currently, but I would love other ideas that are inexpensive and quick! 1.Not maybe the fastest, but I am scrambling eggs, and cooking lentils and rice for one breakfast. I am just joining the party tonight. Sad I’ve let so many days go by. We’ve started school and preschool here so getting back into schedule was priority for us the last week or so. I’m proud of accomplishing several big projects the last couple days and look forward to finishing more. Rearranged my son’s room: created more floor space, gave more focus to desk area for school work. Rearranged some things in my kitchen today to finally get my cookbooks out of boxes (we’ve lived here 18mo, my inactivity is a long story). I also scrubbed my kitchen floor today (found some black mold under my micro cart) and hosed down the two highchairs. Oh, and I’ve hung a white board in our kitchen to display meal plans and schedules. Along the lines of day seven, just today I finalized workout plans with my w/o buddy. We talked about it a couple weeks ago and now we’ve set a start date. I am doing better on my bedtime. I have only been about 30 minutes past my 11:00 goal. I have been getting up about 5:45, 15 minutes before my goal! I work 2 evenings per week so I have decided to do a top 3 on those nights. The other nights I am getting my must do’s done. I exercised yesterday, but haven’t had a chance to today. I have been trying to prep breakfast in the evenings since the kids started back to school. I feel like this really saves me time in the mornings! My go to breakfast is always yogurt plus either cereal or a bagel. Cereal is super easy to prep and I don’t spend more than $2/box. I pop a bagel in the toaster while I’m pouring my coffee and it’s usually ready about the time I’m done with getting the coffee and yogurt on the table. We prep the coffee the night before (our pot has an auto-brew), so it’s finished brewing when I get up. My breakfast might be kinda boring, but at 5:30 in the morning, I’m not awake enough to notice! I should try hard boiling some eggs and keeping them handy. That’s simple, too, and would be a great tummy-filler! Wow, 4:35?!? How on earth…??! 🙂 I don’t know how you do it. Thankfully, I’ve got an early bird for a husband (5 AM six days a week…yikes! ), and since he works from home he’s been taking over breakfast duty. I’m so thankful! That means I can get out and walk, then come back and have my quiet time while he’s with the kids and getting something nutritious going for breakfast. We’ve also decided that we miss the green smoothies we used to make regularly, so we’ve started saving to pay cash for a Vitamix. I’m hoping it won’t take us too long; I’m getting antsy! 😉 When I get back from a walk the thought of a smoothie sounds delicious! I am already ok at getting teeth brushed, etc., and getting coffee set up, but these new 5 things are where I constantly run into trouble and find myself playing catch-up. My bedtime is 9:30 so I better go get started! I am so impressed that you were able to get up at 4:35! I’m really enjoying this series Crystal. Breakfast is so easy at our house. Most days we eat eggs. Two each. Healthy, inexpensive, and very quick to make. I keep pre-cooked rice or potatoes in the refrigerator and add a little to the eggs for some carbs and just scramble it together with some pepper. If I don’t have pre-cooked rice or potatoes on hand, we’ll have a piece of whole wheat toast. I also try to keep hard-boiled eggs on hand for the days here and there when we need to leave the house earlier than usual or to pack in our lunches. Every once in a while we eat cereal, but not often. A box will last us over a month, and I often end up tossing the last of the bag because it’s gotten stale. On weekends we like to make smoothies for breakfast. Yogurt and frozen fruit, and that’s all. My tween-age daughter would eat a smoothie every day (so would I!) but frozen fruit is spendy so I limit it. It may be boring for some, but it’s easy and we like it. Sorry, I didn’t mean to reply to Carol’s comment directly. Just mean to add a comment to the thread. Love it! so do you just scramble eggs and toss in the leftover rice or potatoes while you are scrambling? That would work great for our gf diet! Melissa, yes, I just scramble eggs and toss in pre-cooked rice or potatoes and scramble it all together with some salt and pepper, and maybe a little grated cheese. I like to add veggies too — a little onion, green or red peppers, even broccoli, whatever I have on hand, so it’s more like an omelet scramble, but my tween turns her nose up at that, so unless I’m in the mood to cook up two separate scrambles, one for her and one for me — I usually leave them out. With potatoes, I’ll bake extras and keep them in the fridge. Then just cut them up into bite size pieces and add to eggs. If I don’t have any pre-baked, I’ll peel chop and fry a few, and keep enough for a couple of days in the fridge. I prefer baked, but fried works too. I try to always have pre-cooked rice on hand in the freezer (or the fridge if I expect to use it up within a few days). It is so easy to just scoop some out and add it to lots of dishes — eggs, soups, stews, casseroles, etc. You dont’ even need to defrost it — it defrosts and heats up in just a couple of minutes while the dish is cooking. Another idea — put some in a pan with a little bit of olive oil, some black or pinto beans, and some taco seasonings, and you’ve got a quick filling for soft tacos, or add some lettuce and tomato for a quick taco salad. I used to buy the big bags of pre-cooked frozen brown rice from Costco and used it this way. Then they stopped carrying it locally and I was so bummed until I figured out how cheap and easy it is to pre-cook a big pot of rice. Duh! Did my 5 in record time! Bedtime – I got to sleep around 11:15. Up and at ’em at 6:45am! Earlier than scheduled! Did not dance today – not feeling very well. Been doing pretty good with watching what I eat so I think I’ll stick to my calorie counting. I am feeling so great since I’ve started this! I feel so much more organized, and life is just easier! So thank you Crystal for doing this for all of us! I did my 5 evening must-dos, got to bed by 10, and got up at 6:30. I didn’t not get in any exercise yesterday (or today), but these two days I have made my “off” days. I have accomplished so much, so I definitely have something to show for it! I am actually on the Body by Vi meal replacement shakes right now. I started off always having them for breakfast, but sometimes I want real food. Either way, I always eat breakfast. I really don’t like eating so early, but eating early is better than not eating at all! I do want to start making more breakfast meals ahead of time though, that way my breakfasts don’t become so boring because of time contstraints. I did really well today. I got to bed on time last night(10:30) and did my 5 items before bed. I was up a little early this morning 6:15 instead of 6:30. I even did some exercise today. I committed to doing 10 minutes a day as I usually don’t exercise at all. With me being big multi-tasker I decided to walk in place while I was listening to the radio and processing sugar snap peas for the freezer and getting my green beans into my dehydrator. Well it turned out to be more of dancing than walking in place. But I was able to get some exercise in and even more than 10 minutes to boot. I already eat a good breakfast each morning. My breakfast usually consist of whole wheat toast with scrambled eggs. Sometimes it is waffles, pancakes or scones from the freezer which I prepared on the weekend or oatmeal from the oatmeal packages we make ahead. To make sure I am prepared for making breakfast, I usually have something set out to thaw or in mind the night before so I don’t even have to think about what I am making for breakfast. Wow Crystal, 4:35 is SO early! I’ve been a “wake up early” type gal for years, so it has not been a challenge for me at all to get up and get going early. I figured out long ago when my daughter was a baby (I’m a single mother to a now 12-yo) that it is much easier for both of us if I focus on her and our family time in the evenings, go bed when she does because I’m always tired then, and then get up early. I’m just much more productive this way. Neither my daughter nor I ever use an alarm clock. I wake up regularly between 5:00 and 5:15, and the kiddo wakes up regularly around 8:00. When you are getting enough sleep, waking up naturally without the abrupt blare of an alarm is easy. At least that’s been my experience. Rarely, like maybe once a year, I’ll oversleep, but it’s always when I’m run down, sick, or just haven’t been getting enough sleep. When that happens, I just figure I needed the sleep more than I needed to get up early, and let it go at that. I have been doing pretty well with getting up in the morning. The music classes I teach started back up this week and I’m enjoying having the early morning hours to finalize the lessons instead of using up the kids’ nap times to do it. I am a morning person by nature and it’s so nice to be able to get up before everyone else to get things done! My daughter and I went and worked out this afternoon for half an hour. Here are some of our breakfasts – peanut butter and honey on toast, cheese toast, bagels with cream cheese or peanut butter, waffles (I like to make extra to freeze), BLTs, egg in a holes, smoothies, omelettes, egg sandwiches, muffins (making extra to freeze). I started menu planning again and was pinning some new recipes for breakfast along with other meals. One of my favorite breakfasts is brown rice with whole milk, cinnamon, and sugar. I freeze leftover rice in muffin tins, then keep it in a freezer bag (in the freezer). I read somewhere along the way that freezing leftover rice is better than keeping it in the frig. I pull out a couple of “cups” in the morning, microwave it for 2 minutes and add the goodies. Quick, easy, and yummy! I’ve been trying to be in bed by 10:30 (didn’t happen last night because I got caught up making a baby gift that needed to get mailed). The kids and I took a walk between the rainstorms. I have a plan for exercising once school starts, but for now the kids and I are going to walk. Muffins are easy to make, freeze well, very flexible, and there are many healthier varieties available. I recommend King Arthur Flour’s Whole Grain Cookbook as a resource. I’m particularly fond of their Morning Glory Muffins: whole wheat, lots of carrot, wheat germ, apples, raisins, nuts or seeds. It was so nice to wake up to a picked-up house! To a lunch already made! I went back to the earlier routines bookmark (https://moneysavingmom.com/wp-content/uploads/2012/02/routine-cards-final.pdf) and put my evening routine in that and printed it out. Now I must need to develop a morning routine! I have not been doing so well with bedtime, but feel that there have been valid reasons for it. My wake up time is 6:30 am and this morning I was awake before the alarm. Yeah! So despite getting to bed slightly later than bedtime, I still feel that I have been getting enough rest. I have not been incorporating daily exercise into my routine, but if all goes as planned, tonight I have time set aside to evaluate the goals I have set and figure out how to get them on to my daily list in bite-size chunks. This includes exercise. Despite a very very busy day, I still did my evening Must-Do’s and got to bed by 10. When the alarm went off at 6am this morning, i did not want to get up, but I did. I even got some unplanned exercise in walking all over campus yesterday. My breakfast this week has mostly been oatmeal – quick and easy in the mornings. But this weekend, I plan to make some quick-to-grab freezer breakfasts and lunches – with the school year starting, even making time to cook oatmeal will be difficult until our routine is more, well, routine. We’ll definitely have pancakes, peanut butter sandwiches, and freezer burritos, and I have not decided on the rest yet (it depends on what we get in our produce box on Saturday). By the way, has anyone experimented with overnight oats? Not the crockpot kind, but just the kind you put in milk and/or yogurt, add fruit, and leave overnight in the fridge? I think I’m going to experiment with that with steel cut oats in a sealable container that I can just grab and head out the door with (or add to my lunchbag). Bedtime – I didn’t make it to bed by 9pm. I didn’t make it to bed until 11pm. Very long story I won’t hash here. Exercise – I have completed my excercise all 4 days this week. A running program on my treadmill currently. Breakfast – Ok, this is where I get bad. No breakfast. I am addicted to coffee and it fills me up. As my 3 year old ate his oatmeal and grapes this morning, I thought, I should eat something too. But, I am not hungry. Maybe a handful of grapes. Better than nothing I guess. 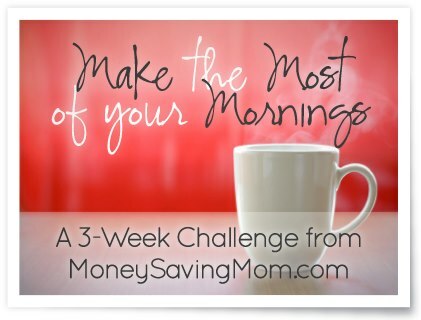 I have done everything perfectly in this challenge, going to bed, doing my 5 must dos, etc. except waking up. I can’t shake the alarm clock snooze button. I still make it up by 630 because that’s three snooze hits. I’ve been doing this for years. It’s so imbedded in me that I can’t stop it. We tried to move it back but I hit snooze 5 times. Ugh…..maybe soon!!!!! Not giving up hope!!!!! We have muffin Monday at our house so I always make a big batch on Sunday night. We have some Monday for breakfast, some later in the week for another breakfast, a few for snacks and I freeze half. After a few weeks of this I have three or four kinds of muffins in the freezer – perfect for late mornings, a quick snack, etc. We also often have omelets (so easy if you have the veggies prepped earlier in the week) and smoothies (make a double batch and freeze some for popsicles for a great afterschool snack). Success on a few counts today! Up by 6:45, made the bed, made myself eat some yogurt (I am one of those who likes to skip breakfast) and got to the gym right away. Woohoo! I’m a total fail at getting to bed early. I still haven’t made my target bedtime. 1) Place english muffin in toaster. 3) slide egg out of bowl (easier if you spray with Pam beforehand) and onto the english muffin. Well, I am also a total fail at getting to bed on time. It just hasn’t happened yet. I’ve been close a few times but no cigar. However, the top 5 must-dos have already made a huge difference. So far our first week of back to school has gone according to plan! I have not found time yet to get in morning workouts, but breakfast has been going pretty good. All in all, it’s made a huge difference even though I haven’t implemented everything! I got the Must-Do’s done, but I was about 30 minutes late to bed. The previous 2 nights I was on time, so back to it! I was up with my alarm clock at about 5:40 and even took our dog for a short walk–a habit I’m slowly getting back to. Exercise? Not yesterday and not yet today…hopefully before the night. I’m trying to do some stomach strengthening exercises to pull my muscles back together after two close pregnancies. As long as I have a plan for meals and get the dishes ready the night before, I do pretty well. Tomorrow will be baked oatmeal with bananas and blueberries. Bed Time: My goal was 10:00 pm and we got in to bed around 10:30pm. Not too bad! Wake Up: Normally we get up around 5:45, but I used to go back to bed after my husband left for work and would doze for another 30 or 45 minutes. But, today, I was wide eyed and bushy tailed by 6:00am! Exercise: I had to get ready for work this morning, so I didn’t have much time. But, I did a 1 Mile Speed Walk with my favorite work out video. Breakfast: I ate breakfast, but it was a quick, run out the door option: 1 tablespoon almonds + 1 tablespoon dark chocolate chips. Not the best, but probably better than nothing. My goal is to choose eggs or oatmeal from now on. I’ve been doing so-so with my nightly 5. But, I have to say that even an attempt at them has been extremely helpful. So wonderful to have coffee ready to go in the morning! Bedtime has been good, not great – about 11, instead of 10:30 like I was aiming for. I’ve accidentally slept in the last two mornings, but still got up earlier than I used to. However, we are fairly exhausted with some extra family stuff that has come up, and I feel ok about the fact that I clearly needed more rest. At least I felt more ready to go for the morning from the nightly 5! I didn’t read yesterday’s post until today, so I nope, no exercise yesterday. But I’m looking forward to getting that in tomorrow! And for breakfasts…..lately, we’ve been doing “berry good oatmeal” that I prep the night before. I combine 3/4 c old-fashioned oats, 1 and 1/2 c water, 1 c frozen berries, a generous sprinkle of cinnamon, a teaspoon of coconut oil, and a couple of spoonfuls of truvia in a bowl and stick it in the fridge the night before. I microwave it for 4 minutes in the morning, add a scoop of vanilla whey protein powder, and stir well. That serves me and my two boys, and we have a banana each as well. My kids say they feel like they’re getting dessert for breakfast, and it’s so healthy! Thank you for this series, Crystal. I was laid off recently and am using this time to figure out what I want to do with my life plus get caught up on projects that were put on the back burner or just in my “dream” file. Well, ideally that’s what’s happening. In reality I traveled for 2 weeks right after the layoff, then spent a week recovering and catching up, then had a pretty good week of making progress, then came down with bronchitis that zapped my energy for about 10 days, and now I’m trying to get back on track. I’m someone who needs structure, who thrives on it, and now that my days are completely my own for the first time since I was 16, I’m not quite sure what to do with myself. I have a lot of goals and ideas and “want to’s” but am floundering when it comes to actually getting them done. Your challenge came at just the right time! Time I woke up this morning: 8:45, to the sound of my door bell! I totally failed this one this morning! 40 min of strength exercise. for breakfast but also help out with lunches and dinner plans for the week as well. I eat almost the same thing for breakfast every morning; scrambled eggs in refined coconut oil. Sometimes, I’ll add cheese or cottage cheese. It’s the most filling breakfast, and I think it’s the combination of protein/fat that keeps me full. If I were to have oatmeal, I’d starve in an hour. What I did was measure out servings in almonds and cashews and put them in snack baggies, and mix them together. So I’d take half a serving of almonds and half a serving of cashews and mix. I also bought those mini pieces of dark chocolate so I can have with them. It’s great for a sweet/salty mix together. Just let the chocolate sit and melt in your melt. It’s just enough to curb any chocolate craving. THIS is my greatest challenge! Setting and following a menu plan has been so hard for me. I’ve done it before, but for some reason recently I have a block about it. I know I’ll get it eventually. I have been having a good breakfast, though. Homemade yogurt (sometimes with fruit) and a slice of toast with almond butter. Tasty stuff!